I had high hopes for Fe. I’m a sucker for charming journeys told without words, where you’re left to figure out your way through your own wits and clever environmental clues. I have an especially weak spot for wordless games that take place in nature or ruins, and involve some sort of magic or otherworldly ability. 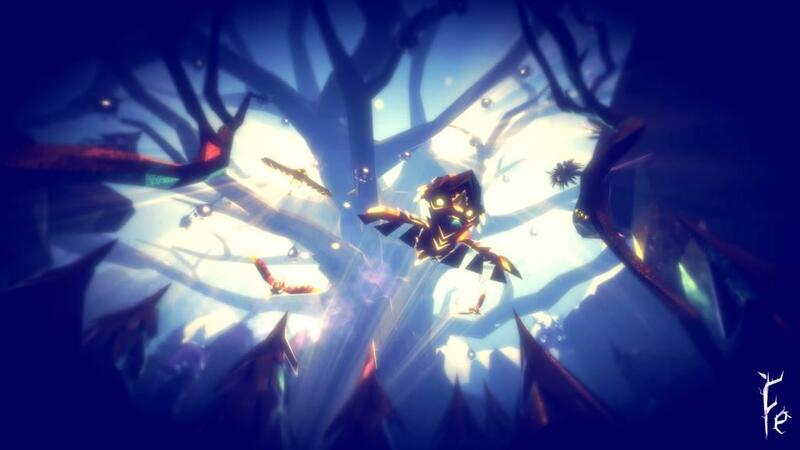 Fe checks all of those boxes, and brings to the table a unique and stylistic design that I personally thought was beautiful. What is actually there in the game does not harm its quality; it’s what’s missing that made me feel like the game could have been so much more. You begin the game as a small fox-like creature called Fe that plummeted from the sky in a meteor, or something like one. You can walk and jump, but the most important thing is that you can sing. This is how you interact with other flora and fauna in the game, with a catch. There are different languages for different species, and until you learn the right language you can’t speak with the adult animals, nor can you activate the plants (which each have their own vaguely magical function that help you navigate through the map). Right from the get-go, you’re unsure what exactly you’re doing in this strange forest. This isn’t necessarily a problem in wordless games, and wouldn’t end up being a problem at all if there were some definite answers embedded within later parts of the game. Thing is, there aren’t. You get vague ideas of the plot through ancient art inscribed into walls as well as flashback-like cutscenes, but too often the plot details seem just out of reach. This sort of “figure it out as you go” mechanic in games is a tricky tightrope to walk. There were a lot of factors at work behind Fe’s not-quite-success-not-quite-failure here, but the largest was the fact that they seemed to be hanging from that tightrope rather than balancing on it. The game is very good at teaching you how to work with each of its mechanics, even if its start is a bit halting; however, the plot itself (or what I would call the main questline, if this was the type of game to have quests) was foggy. Sometimes I just felt like I was wandering in a direction, knowing that it was where the game wanted me to go but not quite knowing why. And then I would stumble into the next objective, and I would briefly regain my footing before losing track of it again. This fogginess wasn’t helped by the map design (but not the art design, which I’ll get into in a second). Spatially, it was difficult for me to keep track of where I was on the map, because the environments were difficult to distinguish from each other. That’s not to say that they were exactly the same; the color schemes and wandering animals changed between environments, and there were a few key plants and rock formations that were unique to their respective areas. Other than that, though, there weren’t as many notable landmarks or unique terrain aspects as there should have been, making me feel like I wasn’t quite sure where I was going. Much of the guiding that the game does is via smaller objects. 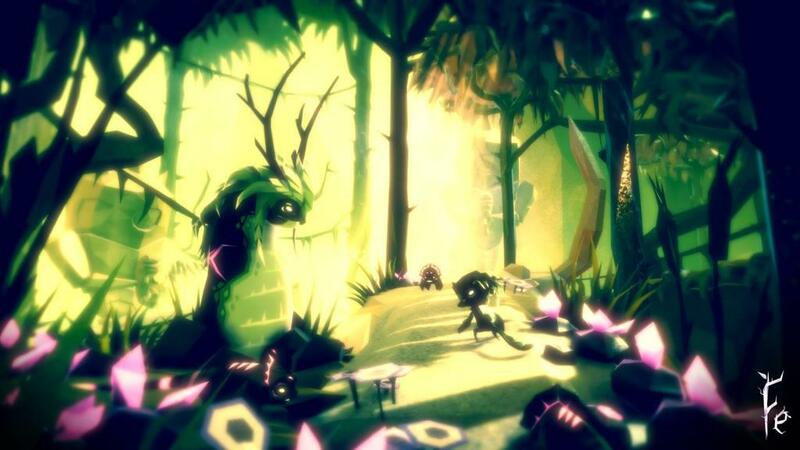 The game establishes early on that you’re meant to sing to interact with objects and plants, which can function as anything from trampolines to projectiles. Nine times out of ten, I could tell where the game was pointing me based on where the glowing flowers were pointed, or where there happened to be more climbable trees than usual. This? Excellent. A wonderful mechanic. Problem is, those are all tiny objects compared to the scale of the full map, like individual stepping stones. They let me move forward, yes, but I could only see the next stepping stone—not the ultimate destination. One of the benefits of this is that you don’t get lost as much (and even less, once you unlock your little bird friend that you can summon from anywhere to point the way). But god, of all the places to get lost, I would want it to be in this game. 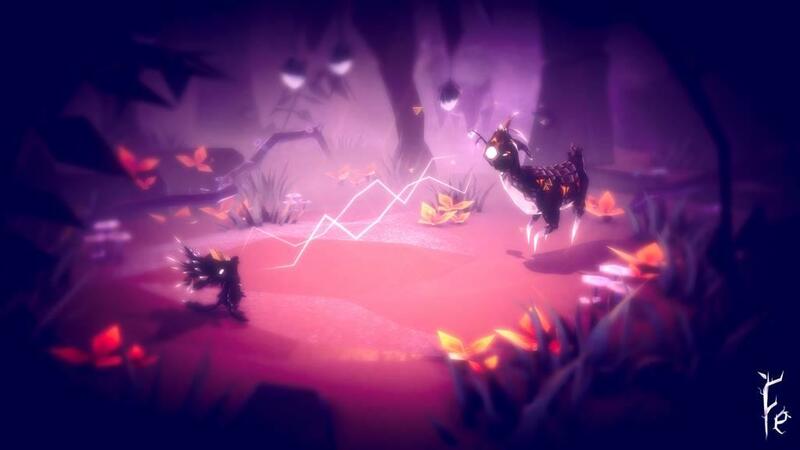 Fe’s strengths rest by far in its visuals and music. The colors are gentle and the animals calming, but it’s not a happy fairyland. The environment is angular, suggesting right from the beginning that this is not a land where all is well forevermore. There’s something otherworldly about the ambiance, especially in its shifts. When you venture into an area with a concentration of enemies, the air around you might shift from a soothing violet to a muddled orange, like flames. It’s a study in color theory, and it’s beautiful. Sad as I am to say, the beauty of this game is in and of itself another missed opportunity. In each area, there is an animal that serves as the matriarch or patriarch of all the others who will teach you its language, and the tone is set fairly early on—or so I thought—by an absolute behemoth of a deer, elegant and mystical even as it thrashed in pain. And I’m talking mountain sized. It was gorgeous, and easily one of the best areas of the game. However, that did not continue as I’d hoped; some of the language-teachers were downright small, and I even had trouble figuring out that one or two were anything other than a normal adult animal. Predictable a route though it might have been, I’d have much preferred that the drama of the deer area had been maintained throughout the game. It might have also helped with the issue of spatial confusion; though I found myself wandering throughout the world, turning circles in different areas, I always knew exactly where I was in the deer area, and found it the most enjoyable anyways. The behemoth deer was the focal point that tied it all together and made it work. So I’ve done all this. I’ve learned all the languages, navigated all the areas, admired all that there is to admire, and am now on my way to the end of the game. But on my way, I remember something that until now had been buried in the back of my mind. 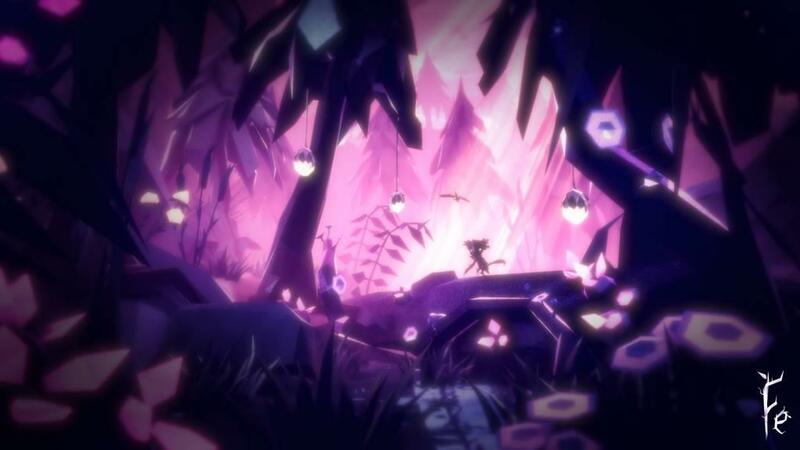 At the very beginning of the game, we were shown a hub in front of a great tree, and thus prompted to go collect a sort of purple shard that would then unlock passive abilities. This was pretty important for the beginning of the game, where you learn to glide and climb trees, but after that it just seems to fall by the wayside—to the point where I all but forgot about it until the end of the game. Of course, I still collected the shards as I came across them, but forgot about them soon after I picked them up, because the way they are scattered about the map makes them seem more like collectibles rather than important gameplay aspects. Thing is, I’m still not sure if those shards are meant to be collectible or not. I only remembered about them when I was about to beat the game, and why place so much early-game emphasis on something that you don’t even need to collect to complete the story? Heck, you can all but forget about them and still have little to no trouble following the main storyline. They felt, again, almost like an afterthought—not quite, but enough to the point where they didn’t feel entirely integrated into the game. Regardless of my confusion, I reach the end of the game, which exemplifies everything right and wrong with the whole thing: its beautiful visuals, its confusing plot, and its want for more. It was appropriately dramatic at its conclusion, with stunning visuals and enchanting music as usual. We find out the truth behind the enemies, which…is still confusing, and leaves more questions than answers. We have…saved the forest? It’s hard to tell, since we didn’t exactly figure out what exactly the enemies were doing to threaten the land in the first place, just that it wasn’t good. Nothing was inherently bad about this game, or so I felt—and honestly, I enjoyed playing it very much. Fe has so many merits, but it just seemed like most of them stopped half a step short of what they should have been. Certain aspects prime you for an impressive and gorgeous experience, but it doesn’t always follow through, which can be disappointing considering how cool some of that stuff is. That being said, it shouldn’t be forgotten that said cool stuff is in fact in the game, and are a testament to what Zoink can do. I’ll definitely be keeping an eye on them in the future, and am really excited to see what they come up with. 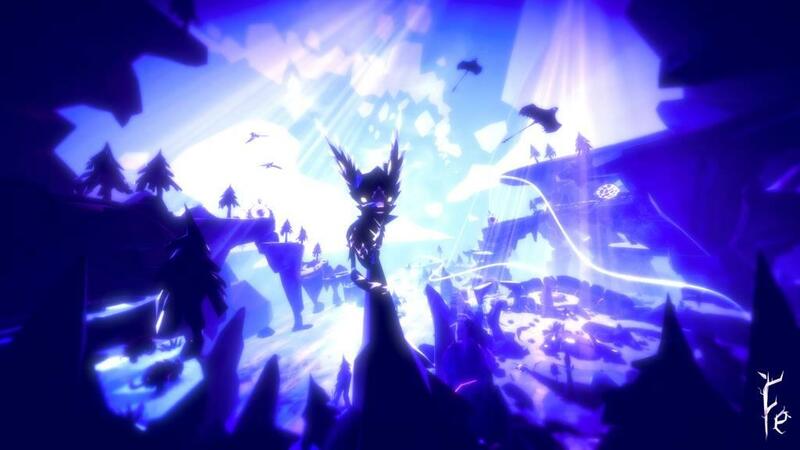 Fe is a beautifully ethereal game that, despite its flaws with plot comprehension and spatial organization, is a pleasure to play. 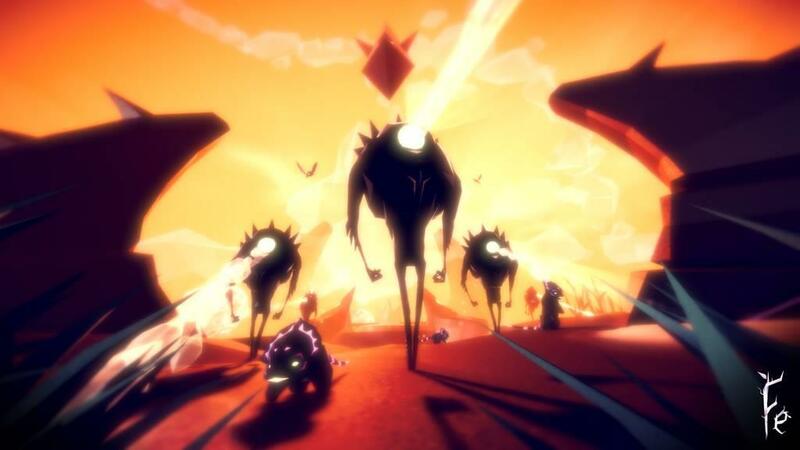 If you’re fine with wandering, and don’t mind the feeling of being swept along on a journey rather than pioneering the journey yourself, then the weak points of this game will seem a lot less weak.